Howard Dwight Smethers born March 25, 1930. He was the first child of Howard & Marjory Smethers, and has a younger sister Pat Chrisco, of Olathe, Kansas. He was born in Concordia, Kansas. He is survived by wife Ruth Alice Neff of 67 years, they met in High School Band Class. He was a Master Sargent in the National Guard for 10 years. 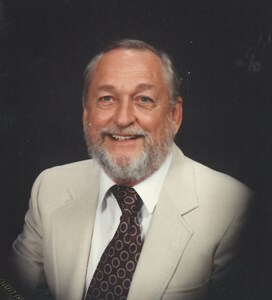 He was a long time School Board Member and over saw the expansion of Olathe School System and Construction of Olathe South High, among other school additions. He graduated from Kansas State University, with a Mechanical Engineering degree. Howard was a High School Teacher and local business man. He owned a gas station and auto repair shop. The auto shop is still in business and owned by his third son Ed. Howard had a Love of Cooking, Gardening, Camping and Traveling. He and his loving wife traveled extensively through out the US, Mexico, Canada and Europe. He hand-built a camper and trailer. His craftsmanship included, working with wood. He also built additions to the house he loved, that included a workshop and Green House. He considered himself the ‘Last Liberal in Kansas’ and was proud of it. His great sense of humor made him a delight to friends and family and he loved playing with his grand children. Memorial contributions may be made to Villa St. Francis, 16600 W 126th St., Olathe, Kansas, 66062. To leave a special message for his family please use the "share memories" button above? Add your memories to the guest book of Howard Smethers. Howard was a wonderfully funny guy and a generous friend to so many. What can I say? He was the BEST Father in Law anyone could ask for!!! He was also a WONDERFUL Grandpa!! His love for family & his humor & recipes will always be treasured. Howard, you will be tremendously missed by us all. Howard was a very special man in my life. He hired me to be one of his female petroleum merchandisers. He always was like a dad to me while I worked for him and he taught me a lot about working with the public. I also had the privilege to be his teacher’s aid in the auto tech program. My prayers are with all of Howards’s family. He truly made such a positive difference in my life. My condolences to the family on his transition. I knew Mr. Smethers, but didn't have him as a teacher, but had Mrs. Smethers – the best teacher I ever had. Thank you for your many years of service in public education. Howard has been a long-time friend. He was an excellent raconteur, an ethical teacher, as well as an honest independent mechanic, a politically-informed individual, a skilled cook and craftsman who was also a patient bridge player. He balanced those traits with a booming voice and unrestrained candor in expressing his opinions. Howard kept active after others would have quit. Phyllis and I were privileged to call him our friend. I had the pleasure of spending time with Mr. Smethers in auto mechanics class in 1961 as a student of Olathe High (now Olathe North) He was a great guy, he was fun, always upbeat, made class enjoyable. I know I share these views of my classmates who had the opportunity to have him as a teacher. I had two favorite teachers in high school and one of them was Mr Smethers because he was my Auto Mechanics teacher and Welding teacher. He inspired me to want to be a High School like him, so I decided to major in Industrial Arts Education when I began college. Unfortunately I was not financially able to finish college and gave up my dream. However, I did start out working for an automobile dealership right after dropping out of college as a lube tech (grease monkey) and light duty mechanic. That worked into becoming assistant service manager for a while. Then after spending 8 weeks in San Antonio, Tx. going through Air Force basic training for the Air National Guard, I returned to the same dealership only to find that my position had been filled so I was assigned to the parts department where in a few months I worked up into management. For the next 35 some years I worked for a number of GM and Chrysler Corp. dealerships in the capacity of Parts or Service management and I feel this was all possible because of the training and inspiration Howard Smethers gave me. I retired in 2004 and am currently 76 years old. I have often thought of Mr Smethers through the years and what he meant to me in my life. I mourn his passing and send my condolences to his loved ones, may he rest in peace in the House of The Lord. I'm so sorry to hear of Howard's passing. We had a lot of fun get togethers. My thoughts and prayers to the whole family. We want to share our most deep felt condolences to the Smethers family. My husband and I have fond memories of Mr. Smethers from our high school years. My husband especially, has so many memories and the deepest respect for his former teacher. Mike loved Mr. Smethers and has continued to have a love for auto repair and restoration sparked by Mr. Smether’s influence. Just now Mike remembered first meeting his new teacher in class. “You don’t have to call me Mister, you can just call me Smethers, but don't call me Howard.” God rest your soul, sir. Your influence in this community is felt by many. My deepest sympathy to all who loved him. I was a classmate of Ed's from grade school and took my car to the Smether's garage for years. Once I went to their house and Mr Smether's took great pride in showing me around. He was especially proud of his greenhouse. He was always kind and caring. Fond memories growing up around him and his family. The greenhouse, the backyard and yes the old camper. Thinking of Olathe’s loss and praying for the family. My sincerest condolences to the family. A wonderful teacher and mentor to many. A good man.